Here’s a Stay Puft hockey jersey based somewhat on his naval uniform. 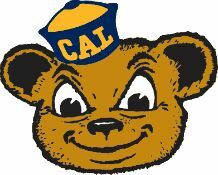 His portrait logo is based on the retro Cal Bears logo. Posted on October 13, 2013, in Geeky Hockey Jerseys Available, Geeky Jerseys, Hockey Jersey Design and tagged Ecto-1, Geeky Hockey Jerseys, Ghostbusters, Ghostbusters 2, Hockey Jersey Design, Stay Puft. Bookmark the permalink. 14 Comments. I want the Stay Puft. Wordmark very inspired by the Wild’s alternate I reckon, and I love that jersey of theirs. Baseball script is becoming really popular for hockey. I’ve done a few designs for kids and beer league teams that wanted that particular look. PLEAE make these available! I would totally rock this at the Halloween game!! I love these great concepts would love to have the ecto1 jersey. Just one suggestion though. If the ecto1 jersey gets offered how about offering it with a yellow name plate on the back instead of just a name. You missed out on a few of these in recent months. Stay tuned, a Busters jersey will be available again in the coming months. Got mine when the limited return happened. Was kicking myself for missing it when I had the chance. It is of higher quality than I even expected. glad I got a second chance. I am inclined to buy some others now too. Forgot to mention which one! Stay Puft Marshmellows! was just looking for images of cam talbot’s helmet when i stumbled upon this blog. I cannot express the roller coaster of emotions of first thinking i had found an ecto-1 jersey, and then realizing i cannot have it. Waiting for v4 re-release. Ecto 1 is a must have and I do love the gb2 one. That ECTO- 1 though…. Hey my friend in australia wants to know if she can get the Stay Puft shirt? Are you still making it? You just missed out on a recent Stay Puft offer that ended February 15th. Check back at http://www.geekyjerseys.com in a few months, they’ll make some available for sale in their In-Stock section.